On arrival at Cochin airport at 10:00 hours, transfer to Munnar (140 kms/4 hour drive). En route enjoy beautiful streams, waterfalls, rubber, pepper, cardamom and tea plantations and thick forests. On arrival in Munnar at 14:00 hours, check in to hotel followed by lunch & afternoon at leisure. Evening dinner & overnight stay. Munnar Morning post breakfast at 08:30 hours proceed for a sightseeing tour of Munnar covering Mattupetty Lake & Dam, Echo Point, Kundale Lake, Blossom Garden, Rajamalai and Eravikulam Wildlife Sanctuary – famous for the Nilgiri Tahr and tea gardens. In between lunch in a city restaurant at 13:00 hours. Evening at 17:00 hours back to the hotel for dinner & overnight. Morning post breakfast at 09:00 hours, check out of the hotel and depart for Kumarakom (Approx. 200 kms/5 hours’ drive). En route plantations. On arrival at 14:00 hours, check in to a hotel followed by lunch. Later at 15:30 hours visit the Kumarakom Bird Sanctuary. Late afternoon enjoy a sunset cruise in backwater. Evening at 18:00 hours back to hotel for dinner & overnight. Kumarakom- Alleppey- Houseboat Morning after breakfast at 10:00 hours check out from hotel & drive to Alleppey. On arrival, check into houseboat at 12:00 noon followed by lunch on board. 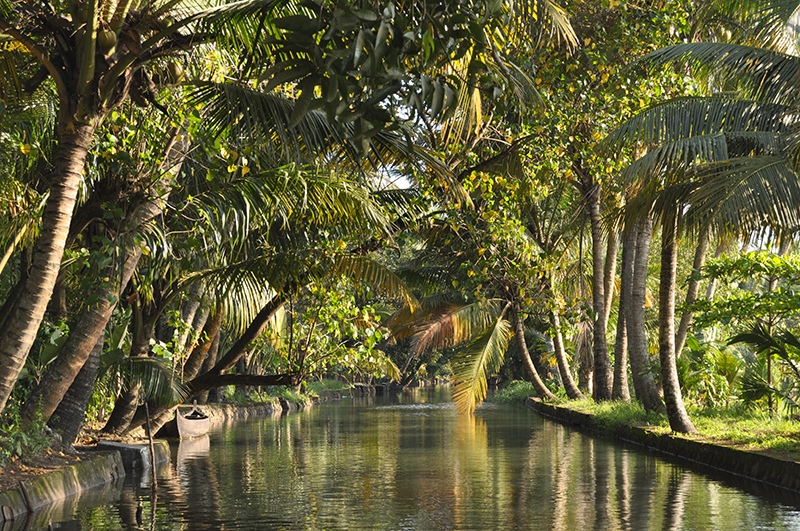 Afternoon at leisure and enjoy the backwater cruise. 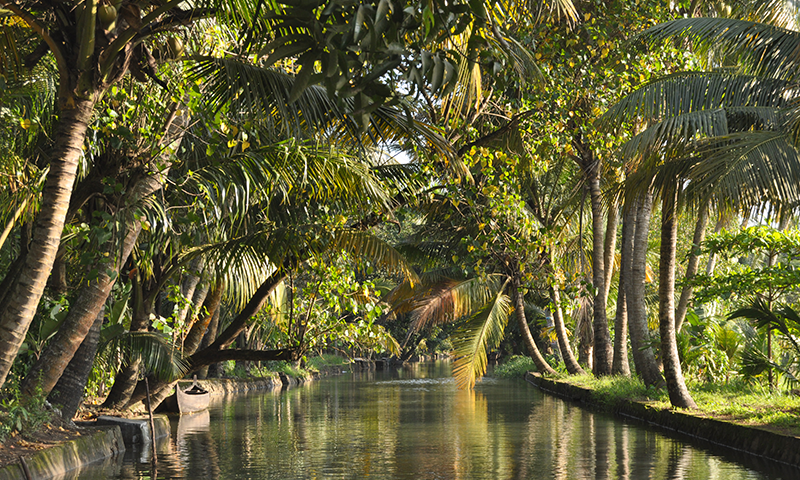 Houseboat cruise is the best way to explore the beauty of backwaters & village life of Kerala. Enjoy evening tea/coﬀee with snacks followed by dinner in the houseboat. Stay overnight in houseboat. Houseboat- Alleppey- Kovalam Spend the morning at leisure on the houseboat & breakfast. Later at 09:00 hours, disem- bark houseboat at Alleppey and drive to Kovalam (190 kms/4.5 hour drive). En route visit the coastal areas with the coconut trees and a view of lagoons and palm-fringed Arabian Sea. On arrival at Kovalam, check into hotel & lunch. Spend the rest of the day at leisure. Dinner & overnight in Kovalam. Kovalam- Thiruvananthapuram- Kovalam After leisurely breakfast at 10:00 hours proceed for a sightseeing trip of Thiruvanan- thapuram (Approx. 15 kms/30 mins one way). Visit places of interest including Napier Museum, Kuthiramalika Museum and Sri Padmanabha Temple. Lunch at 13:00 hours in a city restaurant. Afternoon back to the resort in Kovalam to relax and taste Sea Food in beachside food outlets. Evening at 18:00 hours back to the resort for dinner & overnight.